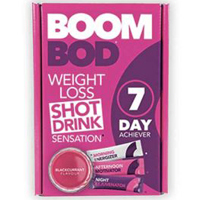 BoomBod 7 Day Achiever is a weight loss system that uses drink powders as the form for its supplements. While that isn’t entirely unique in and of itself, it has still attempted to stand out from the rest by creating a bit of a program out of the products. While most products of this nature are created so that you can scoop a powder and enjoy it when you want to or on a set schedule, BoomBod has taken this a step further. This product comes in the form of a kit that contains everything the user needs to diet with it for seven days. 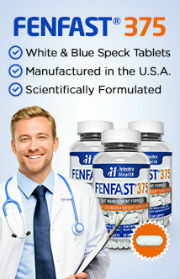 It claims to work because it is made of “clinically proven weight loss fiber” which also provides a blend of vitamins. These powders are packaged in measured portion sachets. Each sachet is prepared by mixing it with water. They are all flavored and don’t contain sugar or aspartame. They also don’t contain caffeine or any laxatives. They are vegetarian friendly as well as being gluten and dairy free. The week’s kit comes with 7 of the Morning Energizer sachets, 7 of the Afternoon Motivator sachets and 7 of the Night Rejuvenator sachets. The ingredients in each BoomBod 7 Day Achiever product are as follows. Morning Energizer: Glucomannan, Magnesium Citrate, Acidity Regulators (Sodium Citrate, Potassium Citrate, Calcium Citrate), Colour (Beetroot Red), Flavoring, Acidity Regulator (Citric Acid), Sweetener (Acesulfame-K), Vitamin C (as Ascorbic Acid), Sweetener (Sucralose), Ferrous Fumarate, Zinc Citrate, Vitamin B6 (Pyridoxine Hydrochloride), Riboflavin (as Vitamin B2), and Chromium Picolinate. Afternoon Motivator: Glucomannan, Acidity Regulators (Sodium Citrate, Potassium Citrate, Calcium Citrate), Colour (Beetroot Red), Magnesium Citrate, Flavoring, Acidity Regulator (Citric Acid), Sweetener (Acesulfame-K), Vitamin C (as Ascorbic Acid), Sweetener (Sucralose), Zinc Citrate, Vitamin B6 (Pyridoxine Hydrochloride), Riboflavin (as Vitamin B2), Thiamine Mononitrate (as Vitamin B1), Chromium Picolinate, Vitamin B12 (Methylcobalamin). Night Rejuvenator: Glucomannan, Acidity Regulators (Sodium Citrate, Potassium Citrate, Calcium Citrate), Colour (Beetroot Red), Magnesium Citrate, Flavoring, Acidity Regulator (Citric Acid), Sweetener (Acesulfame-K), Sweetener (Sucralose), Zinc Citrate, Manganese Gluconate, Copper Gluconate, Vitamin D3 (Cholecalciferol), Riboflavin (as Vitamin B2), Sodium Selenite, Biotin. The official website for this product does not provide the amounts of the ingredients nor does it cite any studies that would support the use of these formulas or their individual ingredients. 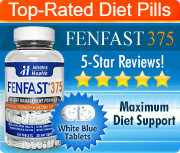 While there are some ingredients in these products that are common in weight loss pills, it is important to point out that they do contain magnesium citrate, which is often used as a natural laxative. As this product also claims not to contain any laxatives, this calls into question any of the claims made about it on the official website.